Any design studio needs an attractive and effective website that would convey the company's identity the best way. One of the FlashMoto CMS templates can be a great base for making such a website. 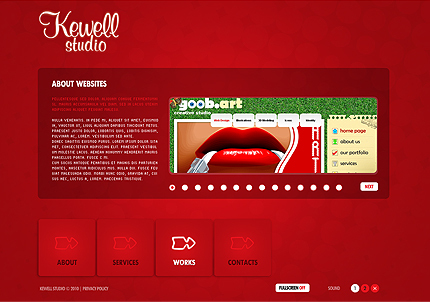 The initial design of this template is stylish and neat, putting the main accent on web studio's work. Moreover, you can customize the pre-made template to the fullest via intuitive editing environment of FlashMoto content management system. Using a wide range of tools and options you can create a totally unique website design, so that no one will believe it was once a web template. And no professional skills required!